What is design philosophy and why is it needed? This important book explains the discipline's recent emergence, the key questions which dominate it, and its potential to fundamentally change the way we practice and think about design. The reader comprises eight thematic sections, each featuring a short, contextualising introduction and an annotated bibliography. It considers social, graphic, product and industrial design, and presents the writings of such leading design thinkers and philosophers as Deleuze and Heidegger, Aristotle and Plato. With texts ranging from philosophically informed writing on design and culture, to ancient and contemporary philosophy which addresses the concept of design, The Design Philosophy Reader is an impressive and pioneering work. 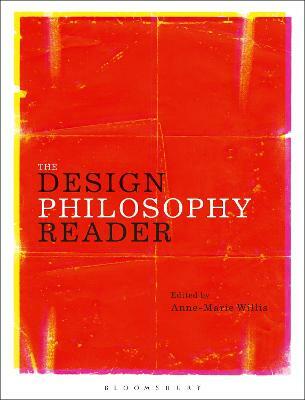 Buy The Design Philosophy Reader by Anne-Marie Willis from Australia's Online Independent Bookstore, Boomerang Books. Anne-Marie Willis is a design writer, editor, and educator, and currently professor of design theory at the German University in Cairo. She is editor of the international refereed journal, Design Philosophy Papers and is the author of many papers, articles and three major books.